Those of you watching the Open Cloud Computing Interface (OCCI) mailing list over the weekend may have spotted the Resource Types: Compute / Network / Storage thread which the cloud computing stack was discussed. 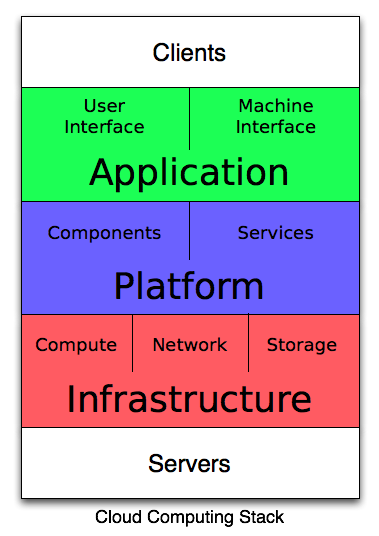 Although a little off topic it was useful for framing the first use case for OCCI (Cloud Infrastructure Serivces aka IaaS) and the result of the discussion was some refinement of my cloud computing stack that Wikipedia’s cloud computing article (among other things) is based on. There was some contention over the use of the term “fabric” for the bottom layer given it has also been used with platforms like Azure, so thanks to Alexis Richardson for suggesting the (obvious) “Servers” replacement. While not perfect I can’t think of anything better, and it fits nicely with “Clients” at the top layer, making this a fully functional taxonomy for cloud computing. Other changes include pushing “storage” down into the infrastructure layer and “services” into the platform layer (ignoring mashups and the like for the sake of clarity) and sticking with the application layer after considering changing it to “software”. It’s available under the new Creative Commons Zero license (essentially public domain).